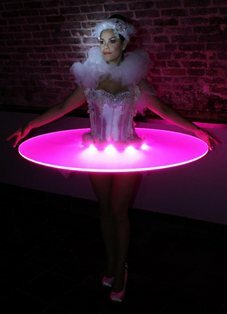 Contained within circular, glass like tables, these luscious ballerina inspired costumes allow freedom of movement and are designed in opulent white, light reflective textures to maximise the coloured neon glow of your choice. Their elaborately feathered headdresses, delicate white tutus and luxurious satin heeled ballet slippers are the definition of elegance and class. Choose from 8 different colours or even a colour changing table, which allows you to match your theme perfectly. 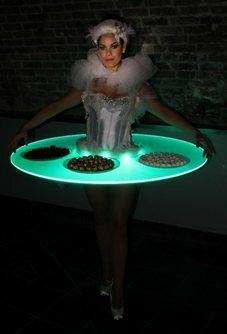 An absolute must for creating an exciting and exclusive ambience at any event. For technical requirements please see the technical specification. 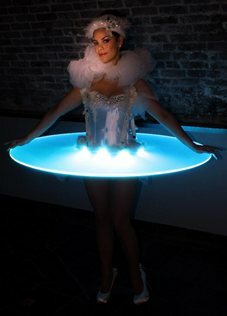 The new Lumi Liquid Light Living Tables use the latest technology in woven illuminated fabric which radiates and glows with glorious white light, (they are battery operated so no need for a power source) adding the most spectacularly elegant touch to any low light event. These exclusive characters bring the ultimate “wow” factor to your party. You will not find them anywhere else in the world! The Lumi Living Tables are draped with the illuminated fabric from head to toe and light up accent headdresses add a touch of elegance in pure shimmering white. Be the one of the first in the UK to experience these stunning liquid light characters. The tables perform a maximum of 15 minutes at a time. They can perform up to 4 x 15 minute sets over a 2 hour period. The tables take up to 1.5 hours to set up. They require a 3m x 4m area for set up as close to the walkabout area as possible. Please note that anything that can stain the white table costumes is not permitted near the tables. 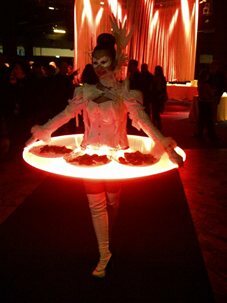 The strolling tables are over 1 metre wide so require a double door or a very wide door (over 1 meter) in order to gain access to a room. We ask that clients provide a spare pair of hands to assist with ‘connecting’ the tables as the plug is at the back and hard to reach. The assistant will be required when putting on and taking off the table(s), this will only take a few minutes. 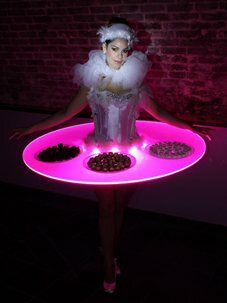 PLEASE NOTE: Strolling tables can only support light food (we provide the clear plates), or jello shots but not any liquid or drinks due to the instability associated with the movement of the table. It was amazing and I would definitely have the human table again. Such fun! The living table, was fantastic. Really made the night come together. Scared some people, but in a good way! The two ladies were professional; they arrived at what was probably the most manic point for me but managed to make sense of my ramblings in order to get themselves ready and in position. These two really caught the attention of the guests who were photographing them and really enjoying the whole atmosphere created. Again these two needed minimal briefing and were able to position themselves in the best place for the event. 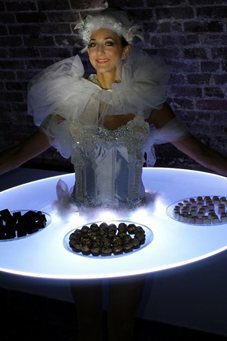 The living tables were brilliant and looked amazing. We will certainly be booking them again. Please pass on our thanks. Thank you so much for all of your help in providing entertainers for our Best Dream Event on Friday. We have received outstanding feedback from everyone who attended and our client, it was such a great night! All of your acts were extremely professional and put on a fantastic show…they were all brilliant and fitted our theme and evening schedule just perfectly. The evening was a huge success and we had loads of positive feedback from the attendees. Helen and Emmy really looked fantastic and I really appreciate the fact that they just got on with their job. …..The living table ladies were lovely and were very professional. They helped me with meet and greet and also served food. I am very happy with all of them – thank you very much. Thanks so much. We enjoyed their performance and they were a hit with the guests. Hope to work with you again in the near future…..